The petrochemical industry is capital-intensive and has the potential to draw investments of multi-billion dollars. While the industry takes a significantly long period to develop, it also produces the highest economic returns and offers high value-add positions with good remunerations, compared to other sectors. Based on Exxon Mobil Energy Outlook 2018, the global population will grow to 9.2 billion by 2040. And rising living standards and expanding worldwide population means a higher dependence on reliable modern energy. Global energy demand will continue to be driven significantly by oil & natural gas. As demand continues, many petroleum-rich countries have transformed from a sole exporter of natural resources, to a downstream petrochemical refiner or manufacturer, adding value to their energy exports. For some, their ambition went further. They create manufacturing clusters, with an objective to build a petroleum or petrochemical hub at a later stage. But, having natural resources and the ability to process it for export does not necessarily fulfil the requirements of a hub creation. Based on Surbana Jurong Pte Ltd’s experience in developing Jurong Island Chemicals Hub, and many other petrochemical manufacturing sites and production zones globally, there are critical factors that will influence the success of a petrochemical hub. Positioning – Where is the Market? 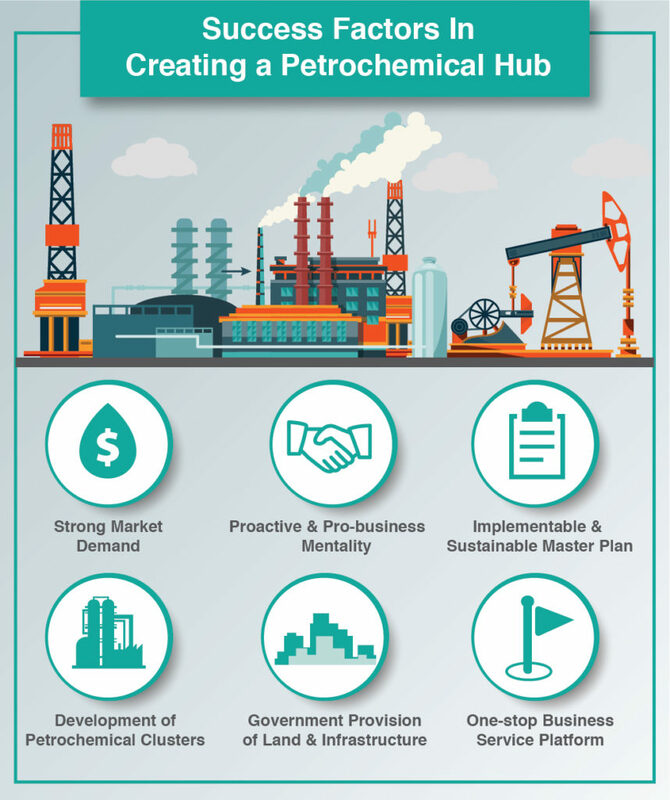 The vision to create a petrochemical hub should fundamentally be supported by market demand (Please refer to illustration 1 for Success Factors in Creating a Petrochemical Hub). The foremost requirement would be to meet the domestic demand of the country which produces the natural resources. When the domestic demand is insufficient to justify the development of the petrochemical hub, then having wider and regional, or even global captive markets would be necessary. Building petrochemical plants, especially a crude oil refinery, can take between six to seven years to complete. Hence, investors and business owners will need to be forward-thinking, and be able to anticipate future demands and predict trends for a time frame of at least 15 to 30 years. Targeting the right sub-sectors for the petroleum and chemicals industry are equally critical. Some countries may yield oil and no gas, while others gas and no oil, or both. Identifying the right sub-sectors to focus, and subsequently forming the value chain to synergize with associated industries can be challenging in the absence of good foresight, marketing and in-depth industry knowledge. The definition of a “hub” does not necessarily mean that it must be geographically built within a single location. The hub can consist of several manufacturing or logistics sites that leverage on their synergistic and strategic natural advantages, bringing benefits to consumers. The availability and ease of obtaining and transporting the natural resources, such as connectivity through pipelines, ports of call, are important factors to consider. Considering the huge investment involved in this capital-intensive industry, it will be worthwhile to meticulously plan and chart out the strategies and development roadmap to minimise risk, and ensure success. Have we understood enough in terms of projecting the market demand and our competitive advantages? Have we identified the different types and capacities of processing & manufacturing plants? What are the logistical requirements needed to ensure sustainability? What are the sub-sectors and supporting industries within the value chain? What are the other land uses, preparatory requirements needed, infrastructure & connectivity, and amenities? Is skilled human capital available, and are safety and environment issues resolved? These factors shall form the backbone of an overall master plan for any hub. The overall master plan must be comprehensive, sustainable and most importantly, implementable. Every country, city or district compete for major investments to support economic growth and create employment. The stakes can be high and in most cases, incentives and preferential policies are provided to attract investors. However, when competitors offer similar incentives, the difference in attracting major investments could boil down to having a differentiating and well thought-through overall master plan. The role of the Government in the development of a petrochemical hub is often contestable. Policies that promote investment and instil investors’ confidence will trigger positive influence on the vision. The Government therefore needs to take on a strategic view to grow the economy, improve employment and employability of the people. For a hub development, it would be instrumental for initial land preparations and infrastructure investment to be provided by public sources, and preferably to continue through for all basic infrastructure investment. Thereafter, the growth of the hub should ideally be driven by the private sectors operating within a realm of pro-business ecosystem. The question of whether Government should partake in any business venture, such as processing plants, is often debated. Production sharing agreements between public and private sectors for upstream exploration and production of natural resources can be contested from time to time. The role of the Government in downstream sectors should be preferably limited to creating a conducive environment for businesses to prosper, and at most, participating in a significantly minority stake to instil investor confidence and for risk sharing with investor. Where critically necessary, the Government could also take the lead in developing critical infrastructure necessary to support the growth or attraction of new investment. The ability to ensure the continuation of policies despite political uncertainties or changes will further improve investment confidence and ensure investors of the political will to realise the vision of a hub. Having a comprehensive overall master plan that captures the essence of attracting investment is important, but more imperative is the ability to facilitate subsequent implementation. The most challenging aspect of implementation is the high stakes involved when major public investment in infrastructure should rightfully yield positive impact on attracting private investment. Creating and institutionalising a platform where functions such as marketing, planning, project management, lease management, customer service, health safety & environment, legal and finance congregate, would help in areas of strategizing and alignment. It also allows efficient servicing of investors and ensure effective implementation of the overall master plan. As there will always be expertise gaps in functions, investing in expertise and capacity building will be the long term solution to support the vision. The realisation of a petrochemical hub is constantly challenged by market volatility, geopolitics, bureaucracy, new technologies and competitions. Yet, harnessing and leveraging on the wealth of natural resources, and utilising them efficiently and sustainably, is ever more critical in the changing global landscape of digital & circular economy. Ultimately, the petrochemical hub, when realised, should improve the quality of lives of its citizens and bring prosperity to the country.